Back in June, I wrote a post in which I tried to understand the murder of Alex Spourdalakis by his mother, Dorothy Spourdalakis, and his caretaker, Jolanta Agatha Skrodzka. In particular, I noted how those who do not blame vaccines for autism properly blamed Dorothy and Jolanta for the murder, expressing sympathy and horror on behalf of Alex. Yet among the biomed and "vaccines cause autism" communities, the general spin to the story was that Dorothy was oh so distraught and just couldn't cope any more; because she had supposedly been failed by the system, poor woman that she is, she resorted to murder, putting Alex out of his misery. That is a horrible, horrible insult to a boy who suffered the ultimate abuse by those who were supposed to care for him. That sentiment, sympathizing with a child murderer, disgusted me then and disgusts me now. Part of the tragedy of this whole thing is that we only have Dorothy's voice being heard. HIPAA regulations block any revelations from the medical professionals being vilified by murder apologists at Age of Autism, Autism Media Channel and so on. Alex's voice has been permanently silenced. To make matters worse, CBS This Morning has decided to lend their support to Alex's killers. 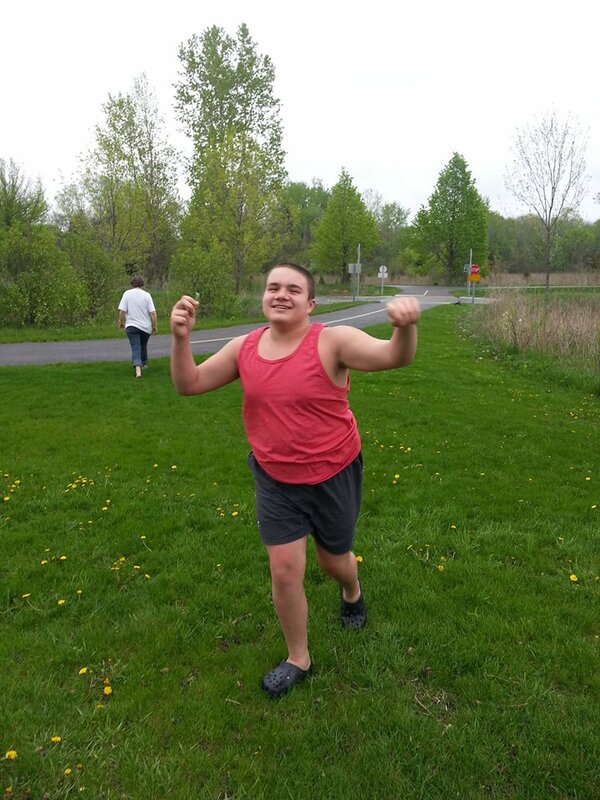 In the segment, Alex is portrayed as a burden to his mother, aggressive, hard to manage. It is sadly an image that is all too common among media portrayals of autism, serving only to stigmatize individuals who already have a difficult enough time being understood and accepted by society. The viewer is left with the impression that Dorothy was driven to insanity (indeed, her lawyer goes on record that he will pursue an insanity defense) and is therefore innocent of brutally slaying her child. Recall, if you will, that according to reports, Dorothy and Jolanta planned Alex's murder for at least a week. They first overdosed him with sleeping pills, and when that did not work, Dorothy took a knife from the kitchen, stabbed Alex several times in the chest, slashed his wrist so severely that she nearly severed his hand, then gave the knife to Jolanta, who killed the family cat so that it wouldn't be sent to a shelter. They then wiped the knife clean, placed it back in the kitchen, and took enough sleeping pills to render themselves unconscious, but no enough to commit the allegedly intended suicide. It was a premeditated and gruesome murder that cannot be excused. The CBS report also parrots the myth that Dorothy did "not have a safety net". Yet as reported back in June, "a Department of Children and Family Services spokesperson says that Dorothy Spourdalakis was offered services, but she refused." According to the CBS video, we know that Dorothy was seeking fringe alternative (i.e., unsupported and unproven) biomed treatments supported by people like the discredited Andrew Wakefield (whose paper purporting to find gastrointestinal issues caused by MMR vaccine was retracted and found to contain fraudulent data) and Wakefield's former colleague from his days at Thoughtful House, Arthur Krigsman. Dorothy had latched onto the belief that autism is just a medical condition. Cure the underlying medical problem (read: GI distress) and you cure the autism. She sought out Dr. Krigsman for that reason, hoping he would confirm her belief. Little surprise that Krigsman discovered exactly what she wanted him to find, and what he has already made a history of finding: purported GI abnormalities. In fact, his activities have landed him in hot water before. seems highly inclined to diagnose the presence of gastrointestinal inflammation on the basis of almost any chronic GI symptoms. For example, he diagnosed Michelle [Cedillo] with “inflammatory bowel disease” in July of 2003, before he had even met and examined her. We have, therefore, an individual whose theory of autism causation is based on a retracted and fraudulent paper by Andrew Wakefield, who has a propensity to diagnose GI inflammation, conduct unwarranted and risky medical procedures, and conduct unethical research, among other problems, diagnosing Alex with GI inflammation. A question I've heard regarding this is, why didn't Dr. Krigsman help Alex? Why didn't Dr. Krigsman's attention cure him? It would seem that Alex was "failed" by the biomed world just as much (if not more, considering the implied "cure") as the legitimate medical community. No doubt, though, this will be excused by claims that Dorothy could not afford it (such unscientific treatments are not, after all, covered by insurance) or some other such excuse. 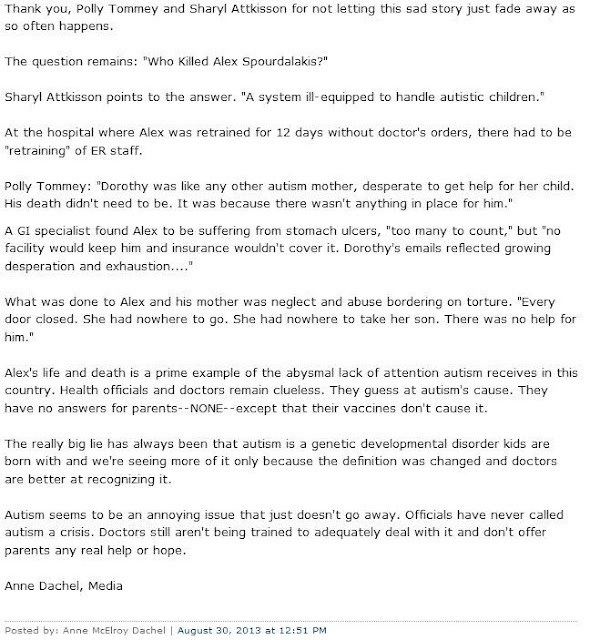 Dr. Gavura goes on to note how the segment also fails to mention that Alex's case was taken up by the autism biomed movement as an example of the "harms" of vaccinations. In fact, the Autism Media Channel "documentary" was originally intended as a piece to showcase and drum up support for the sort of dangerous treatments I mentioned earlier. Now we have Polly Tommey and Andrew Wakefield (co-directors of the Autism Media Channel) shopping their footage around to capitalize on Alex's death. Frankly, this ghoulish behavior is reprehensible, and that CBS would lend their name to it. Note that in answer to the question "Who killed Alex Spourdalakis? ", Dachel does not say, "Dorothy Spourdalakis and Jolanta Agatha Skrodzka". Nope, she says the "system" killed him. Note also how she sympathizes with Dorothy, saying "What was done to Alex and his mother was neglect and abuse bordering on torture". Another north-easterly wind insinuated its futile energies between the massive brick piers of Hounds Ghyll viaduct. Although the wind endured, the earlier downpour had turned to a light drizzle - light for County Durham, in the far north of England - as their journey came to an end. As if for the first time, Mark seemed attuned to his mother's sense of purpose and he offered no resistance. He did not scream, or fight, or hit himself in the face; he did not bite his scarred and scabby arms or suddenly collapse to the ground as if invisible guy-ropes could no longer hold him. Instead, entranced by the raindrops and in awe of the viaduct's ordered brickwork, he mouthed in silent wonder at it all. At the midpoint of the viaduct she turned to the north, the deep valley before her - in places its walls sheer, glistening black, cut by relentless waters that were now barely visible in the fading light far, far below. Mark looked up into his mother's face; beyond its years, alone, harassed, pursued, and he understood her unhappiness. He loved her, although he had no way - no wiring - that allowed him to express this. With the aid of some old timbers she helped him onto the parapet, her grip so firm that it hurt them both. This was the hardest part, the lichened stone wet and perilous, her fear of heights. Standing there at last, against the wind and against the world, he looked at her and she at him. "No," she thought, "this is the hardest part." 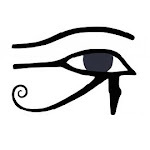 Without a word, without another thought she stepped into oblivion, her most precious possession taken with her, to rank in death with Egyptian queens. They were not equal to the wind and in one final effort it gusted into them, threatening to smash the waif-like Mark into the merciless viaduct. She knew. She was ready. Falling ever faster, she pulled him to her, love and instinct keeping him safe. Wakefield views autism as such a burden that, when it gets too hard, it isn't just acceptable to kill your child, it's merciful and loving. Committing murder-suicide is "keeping him safe". Emily Willingham at Forbes - If A Parent Murders An Autistic Child, Who Is To Blame? A. Parents should think twice about taking children to a doctor who thinks the child's condition is worse than death. B. As you highlighted, one of the sad things here is that this focus on the mother and her problems is objectifying Alex, treating him as less than human, and that is so sad. Is there anyone or anywhere who is telling Alex's story? Focusing on Alex? Where is his dad in this? Thank you for sharing that picture of happy Alex above, and highlighting his uniqueness. Thanks for this, Todd. I am beyond angered by this. My mind can't wrap itself around the idea that CBS, a national, historical, respected news organization went through and somehow found it okay to defend the indefensible. It appears to me that Ms. Attkisson has a lot of friends at CBS to get this story done, or no one was paying attention because of Syria or Miley Cyrus. I tweeted at Ms. Attkisson asking why she called the Autism Self-Advocacy Network (ASAN) a "government funded" organization. She replied that they get funding from the government. I replied that I was surprised that she didn't just call in the "pharma shill" gambit. She replied telling me that I was spinning the story. I then replied with Orac's blog post. She's been silent since. If anyone is spinning the story, it's not me. It's not ASAN. It's not anyone with a gram of decency in their bodies. The only places I've really seen the story focus on Alex is from science and autism bloggers. 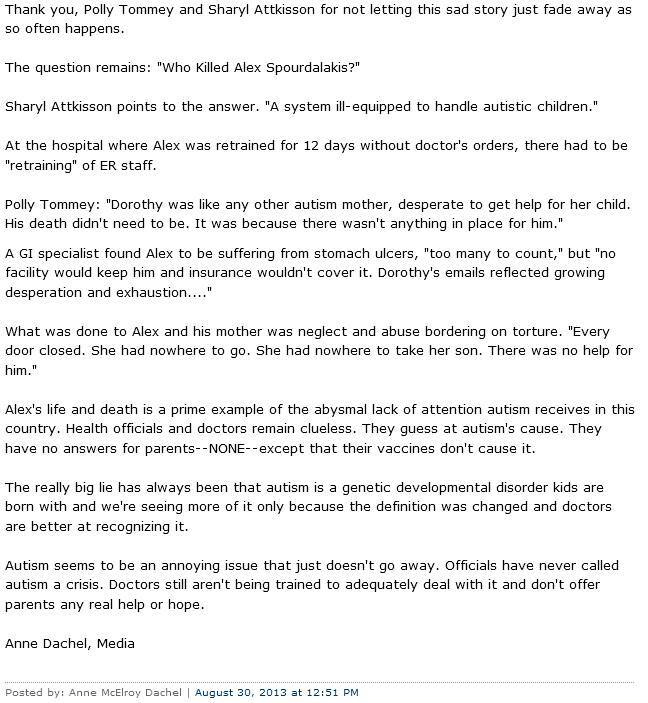 The anti-vaccine folk and those who view autism as something worse than death dehumanize Alex and pity his killers. As for his father, I haven't seen much. He may be (wisely) keeping quiet pending the outcome of the legal issues. Yeah, I saw that Ms. Attkisson moved on pretty quickly to Syria and hasn't answered your inquiries regarding the things she failed to mention.